This is a tough starting hole - A long par 4 with a sharp dogleg at the end of the hole. Off the tee you want to favor the left side of the fairway to open up the view of the green - When playing your approach shot you will be going slightly up hill so look to take enough club to get you all the way to the green. The landing area on the shortest par 4 on the course is heavily treed. Big hitters will want to be wary of the course's 2nd bunker which guards the front of the green. This is a true birdie hole as the green will easily receive a well placed second shot with a wedge. The middle pin position yields a large number of birdies. A great hole with a narrow fairway that demands an accurate drive. The green is surrounded by bush on the back and right side. All the pins are tricky and any ball left above a hole will be difficult to putt. A birdie here will probably win the hole. The first of the new holes, the 5th presents a terrific challenge. The second-longest par 4 on the course requires a good drive that avoids the trees at the corner of the dogleg on the right. A mid-iron into this large but accepting green played to the middle of the green gives you a decent shot at birdie or par to any of the 4 pin positions. The first Par 3 on the course is a challenge. A medium to long iron is required to reach this green and a high shot with a soft landing is a must to keep the ball on the green. Once on the large, speedy green the player must negotiate a good lag putt to ensure a par. A lateral hazard along the right hand side of the hole, woods to the left and a hazard running across the width of the fairway requires an accurate drive. Take about one more club that normal into this green as it is more up hill than it looks. The fairway on this relatively short par 4 hole narrows perceptively in the landing area. A controlled shot with a fairway wood or long iron is the smart play here as you will still be left with a short iron into the green. Only the big hitters can hope to reach the longest hole on the course in two. A drive to the middle or right of the fairway gives you a good look down the fairway to the green. An approach shot to the middle of the green is really the right play no matter where the pin placement is. Attacking the pin, particularly on the middle left is sure to leave you with a chip and a putt for a par. Don't forget to stop in the clubhouse for a snack and a bevie on your way to the 10th tee. The hazard in the middle of the fairway means decision time for the bigger hitters. Depending upon which way the wind is blowing you may want to lay-up or aim your drive right of the fairway to avoid getting wet. The signature hole of the Yellowknife Golf Course features a beautifull vista overlooking Long Lake. The elevated back tee makes this hole play a bit shorter than the distance on the card. However, the wind direction and speed can vary dramtically making club selection critical. 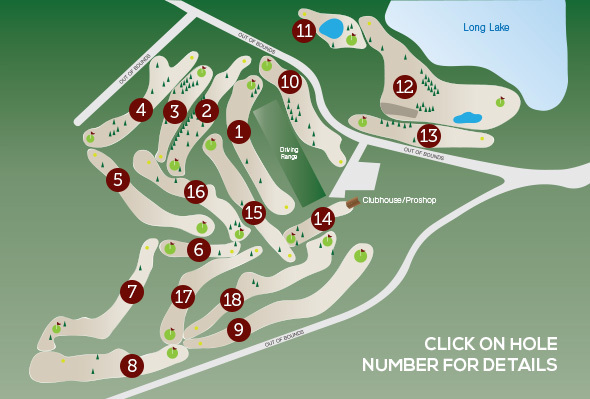 This is a relatively short par 5 that can be reached in two with a good drive. However, if the drive is too good, you can run out of fairway and flirt with bush and "the Pit". A nice draw around the corner and down the hill sets you up nicely for a good birdie opportunity. Take time to catch your breath after the steep walk up the hill from the 12th green. The second shortest par 4 on the course provides a definite birdie opportunity. However, with OB on the left and trouble on the right, including another view of "the Pit", accuracy of the tee is critical to making a good score. Originally the starting hole at the Yellowknife Golf Club, this benign looking par 3 is anything but. The green is more difficult to hit that one would think. And, once on the green, a two putt is anything but guaranteed. The green slopes dramatically from back to front so that anything above the hole is treacherous. Keep it below the hole and you should be fine. This is a tough par 4 by anyone's standard. Although it is straight and has ample fairway, it is very long and the green is tough to hold and to putt on. Par is a very good score here and could win a skin. Keep it simple on this hole. A drive to the wide fairway leaves a mid to short iron to a cross shaped green with a false front. Make sure your second shot gets to the ridge near the middle of the green or it will come back down to the front edge of the green. Another ridge to the top part of the green makes par a good score if the pin is at the back placement. Big hitters can bomb it off the tee and cut the corner on the left. Most of us will need a well placed tee shot in the middle of the fairway just short of the pond about 230 out. From there you will have a mid to short iron into a firm green. It always seems closer than it is when standing in the fairway so think about hitting a 1/2 club extra to get to a green that is well protected on all sides by bush. This hole can often decide a tight match. It is always exciting to have a birdie hole as your finishing hole. This relatively short par 5 has a bit of a double dog-leg effect. However, a good drive down the right side of the fairway gives a great opportunity to cut the corner of the second dogleg and shorten the hole up. The green is two-tiered and will receive a high soft short iron approach very well. Trees left and right protect this hole from wayward approach shots. 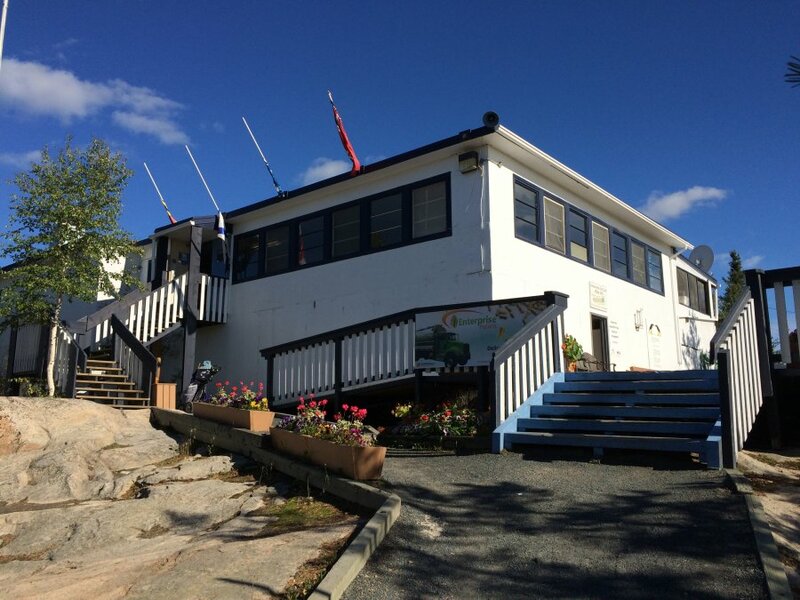 A short hike up the hill to the Clubhouse finishes off your round nicely.